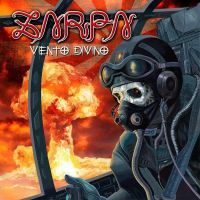 Zarpa return with… another Zarpa album. We sort of pick up where we left off, upbeat metal flowing from not long after the start of opener “Al Desperta”. And the title might remind you that this band has been singing in Spanish for years. It’s a strongly meloodic song and the vocals are nicely subsumed into the music, meaning that non-Spanish speakers can enjoy it all the more. Vocals, and therefore lyrics, are so important that it can be difficult when it’s not what you’re used to! As with the last album of theirs I heard (I’ve missed one or two), this is over flowing with melodic riffs and rhythms. My main criticism then was that the vocal was way too far forward and here it is back a little. That allows the often excellent music to shine and this is all the better for that. There are a number of shining moments and the musical standard is high throughout. The vocal is of the yearning gravelled mild scream type, not my favourite in any language, but I am thankful that it is further back.